Although carbon is one of the key building blocks of life, carbon emissions generated by human activities have been interferring with the natural carbon cycle and led to anthropogenic climate change. The Zero Carbon principle is described by Bioregional as ‘making buildings energy efficient and delivering all energy with renewable technologies’ (other principles cover other sources of carbon emissions such as transport and food). St Nicks Environment Centre, built in 2000, was designed to be energy efficient and to produce renewable energy. Some of the technologies employed are now outdated, or in need of repairs, so there is a lot to learn. In 2016 we are looking at how we could improve the building and in the meantime we’re working towards this principle in other ways. When we don’t produce enough of our own energy, we buy it in from 100% renewable supplier Good Energy. We also hope to inspire others to follow by organising York Open Eco Homes that show how making homes more eco-friendly also makes them more comfortable and cheaper to run. 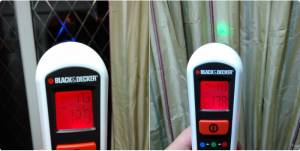 A thermal leak detector in action – showing the difference in temperature between patio doors and closed curtains which help keep the cold out. 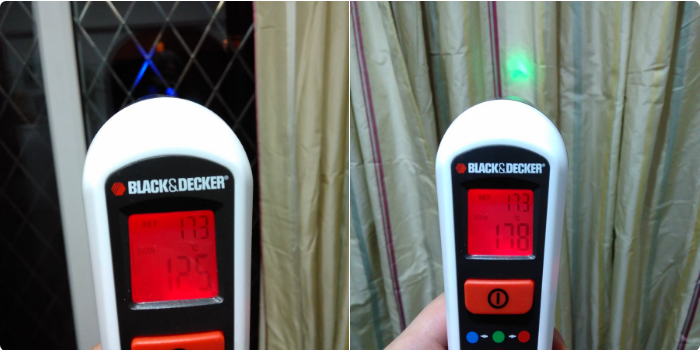 The first step to finding out how energy in/efficient your building is is to carry out an audit or Home Energy Check. St Nicks can lend you energy monitoring devices to help so get in touch if interested. Alternative Technology Centre – an educational resource centre in Hebden Bridge. Centre for Alternative Technology – a great place to visit and be inspired by. Home of the Zero Carbon Britain 2030 project – a vision of how Britain can respond to the challenges of climate change, resource depletion and global inequity. Centre For Sustainable Energy – a great resource aiming to help people change the way they think about and act on energy. Energy Saving Trust – provide expert advice on energy saving and generation, and grants. G.B. National Grid Status – see how much and what type of energy is being used and generated in Great Britian. Hockerton Housing Project – inspiring eco homes in Nottinghamshire, complete with renewable energy installations. Organise tours and short courses. Also check out their retrofitting project. Microgen Database – a database of small scale photovoltaic panel installations around the UK. See how well they work and/ or register your own installation with Sheffield Solar Farm.